Ignited by a lightning strike, the wildfire grew as it travelled down the slope toward the village, eventually engulfing 128 hectares on the steep mountainside before it was contained. Eight months later, a dozen residents remain on evacuation notice over concerns that the fire undermined slope stability and created a new risk from falling debris and a potential landslide. A provincial government analysis last October pointed to the likelihood of rock fall. Now, they await release of a second slope stability report any day to reassess the risk. Despite the evacuation, Ehattesaht Chief Councillor Roseann Michael and her husband moved back into their home last November, unwilling to spend winter in a crowded fifth wheel. Alternative housing is simply not available in the community of about 100 residents. 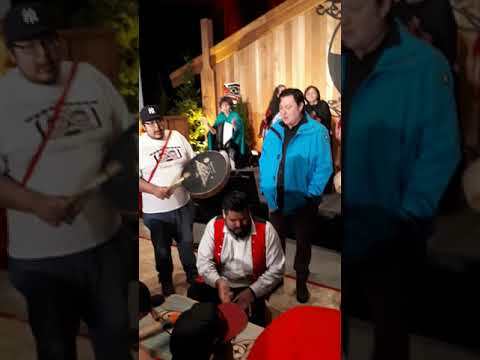 Zeballos and neighbouring Ehattesaht First Nation may find themselves in a permanent state of uncertainty as a result of conditions brought about by a shifting climate. At the height of the 2018 wildfire season, with many northern communities fighting wildfire, the B.C. Assembly of First Nations appealed to provincial and federal governments to provide immediate resources. They reasoned that Canada is obligated to respond to the climate change impact with mitigation and adaptation measures as called for in the Paris Climate Agreement. That is changing, he indicated. The 2019 federal budget tabled in March promises $200 million to be dispersed among 198 B.C. First Nation communities, John said. Every community is supposed to receive funding for emergency training and equipment to deal with climate change impacts. “I think we’re in a fundamentally better position to deal with emergency situations as they arise,” John said. That’s the local support Chief Michael hopes to see in place. While 2017 was B.C.’s worst fire season on record, 2018 was a close second. Last year, 65,000 people were displaced in B.C., many of them from northern First Nation communities. Long-range prediction suggests a slightly warmer and wetter season, yet early April is too soon to predict what lies ahead, said Dorothy Jacobsen, a fire information officer in the Coastal Fire Centre. “We have experienced a very dry March and we are advising people to be very careful when doing back yard burning,” Jacobsen said. As of April 1, there were 28 wildfires larger than 0.009 hectares burning in various locations around the province. Firefighters are in training across B.C. Sproat Lake, meanwhile, sits at a level usually seen in August, the result of a dry March and cool conditions, said Hugh Braker, emergency co-ordinator for Tseshaht First Nation. The Island’s snowpack, an early indicator of the season ahead, was at 66 percent of normal. “People tend to forget about the coast because most fires are in the Interior,” Braker said. Experiences in Ehattesaht, and Tseshaht with a wildfire on Arbutus Ridge last summer, have changed that perception. At one point, 50 wildfires burned on the Island. With the blaze near Port Alberni, Braker was forced to consider issuing an evacuation alert for Tseshaht. “It just shows to me that the coast has dangerous fires, too, and we could have them again,” Braker said. He noted that in mid-May, Emergency Management B.C. hosts a conference to consider, not just spring flooding risks, but increasing hazards arising from climate change. Another precaution: On April 8, the Coastal Fire Centre discontinued use of the “fog zone,” the two-kilometre strip along the west coast that was often exempt from provincewide campfire bans.